Drinks distributor The Gleeson Group is the second largest wholesaler for the licensed trade in Ireland. Established in 1974 by brothers Nicholas and Patrick Cooney, the Gleeson Group's portfolio of brands includes Tipperary Natural Mineral Water, Finches and Country Spring soft drinks. The group also manufactures containers and bottles for its own use and for sale to third parties, including the Kerry Group and Diageo. The company operates out of eight distribution centres - Dublin, Borrisoleigh, Clonmel, Macroom, Drogheda, Cavan, Donegal and Belfast – with a fleet of over 100 trucks and employs almost 600 people. Euromech recently completed the installation of 60 lanes of Drive In Pallet Racking at the company’s manufacturing facility in Borrisoleigh, Co Tipperary, giving a total storage capacity of 2,800 pallets. The Drive In system was designed by Euromech to accommodate a pallet size of 1200 x 1000 x 1900mm high, with each lane being four pallets high. 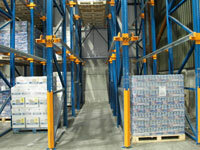 Drive In Pallet Racking is particularly suited to the beverage and drinks distribution industry. The system requires fewer aisles than conventional racking and gives the ability to store 75% more pallets in the same space. 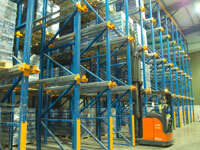 Forklifts physically drive into the rack system to access pallets that are located on a continuous rail. 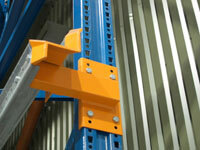 A key design feature incorporated into the system is a profiled Pallet Entry Guide, unique to Euromech racking. The guide automatically centres the pallet to ensure that loads are always square to the pallet lanes. This ensures that the pallet is always presented correctly to the operator, promoting safe handling, ease of use and reducing risk of damage. A backstop is positioned at the end of the pallet rail to prevent pallets being pushed too far into the depth of the rack, eliminating potential damage to spine bracing and further increasing safety.